Baby teeth are designed to last 6-14 years. Also referred to as primary teeth, baby teeth contribute to the overall development and health of every child. Healthy teeth should be all one color. If you see spots or stains on the teeth, don’t be afraid of dental equipment and take your baby to your dentist. Clean your baby’s teeth as soon as they come in with a clean, soft cloth or a baby’s tooth brush. Clean the teeth at least once a day. It is best to clean them right before bedtime. Start cleaning your baby’s mouth even before they have teeth. Gently wipe their mouth with a soft wash rag or gauze. Get them accustomed to you looking in their mouth and cleaning it. This practice will condition them to be less fearful when visiting dental professionals. When your baby is about 18 months to about 2 years old, you can buy a child toothbrush and begin cleaning your baby’s teeth at least once a day. Initially, it is not necessary to use fluoridated toothpaste, especially if the drink water in your area is already fluoridated. Remember, young children have trouble spitting out and usually end up swallowing the toothpaste, fluoride and all. This may expose your child to unnecessarily high levels of fluoride which can lead to fluorosis. Fluorosis, while not harmful, first appears as white spots on the teeth. It is not difficult to look after baby teeth. The challenge lies in teaching your child the process and helping him (or her) develop a healthy, lifetime habit. Knowing how important baby teeth are, it is important to ensure they last. 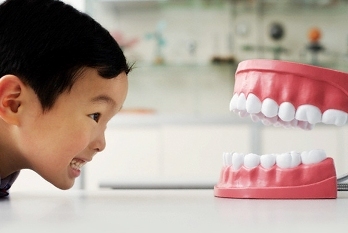 The bottom line is take good care of your child’s baby teeth. Most dental diseases are preventable and not painful in early stages but are expensive to restore.